If you’re visiting the Copán archaeological site, chances are you’ll be staying in the town of Copán Ruinas. Lucky you. Within walking distance of the site, this quaint, cobblestoned community and the picturesque countryside around it offer a tidy selection of excellent things to do, see, and eat—enough, in fact, to warrant spending an extra day or two in the area. Below are some of the highlights. La Casa de Todo means “the house of everything,” and here you’ll find just that: Honduran jewelry, books, and music, as well as a beautiful garden that makes a perfect lunch spot. Try the Maya tortilla soup and fabulous fresh breads. Located in a restored fort, Casa K’inich is an interactive kids’ museum dedicated to the ancient Mayas. Learn how to count to 10 in a Mayan dialect, as well as the fundamentals of the Mayas’ ancient ball game. Settle in with a good book at the mellow Café San Rafael, which offers excellent coffee, Chilean wine, and cheese plates. The colonial Yat B’alam boutique hotel is home to a series of small, upscale shops that sell high-end Honduran crafts, including lovely Lencan jewelry. Set up in the town’s municipal building, Fragile Moments is a photo exhibit featuring images of the Copán archaeological site from the nineteenth century. Harvard University’s Peabody Museum donated the photos to the town after discovering negatives for them in its museum archives. The series is a fascinating glimpse into the site’s past and a perfect complement to a visit to the ruins today. Grab an evening libation at Café Via Via, a laidback spot popular with locals and backpackers, or head to the slightly more sophisticated Twisted Tanya’s for cocktails on the open-air, second-floor dining room. El Puente is the second-most important archaeological site in Honduras. Here, you’ll find pyramids, plazas, and residential areas set on the picturesque banks of a small river. It’s about a one-hour drive from Copán Ruinas. At Finca Santa Isabel, located 40 minutes outside of town, you’ll learn the ins and outs of coffee, including how beans are cultivated, selected, roasted, and ground. Look for tropical birds and butterflies as you explore the farm and surrounding rainforest. 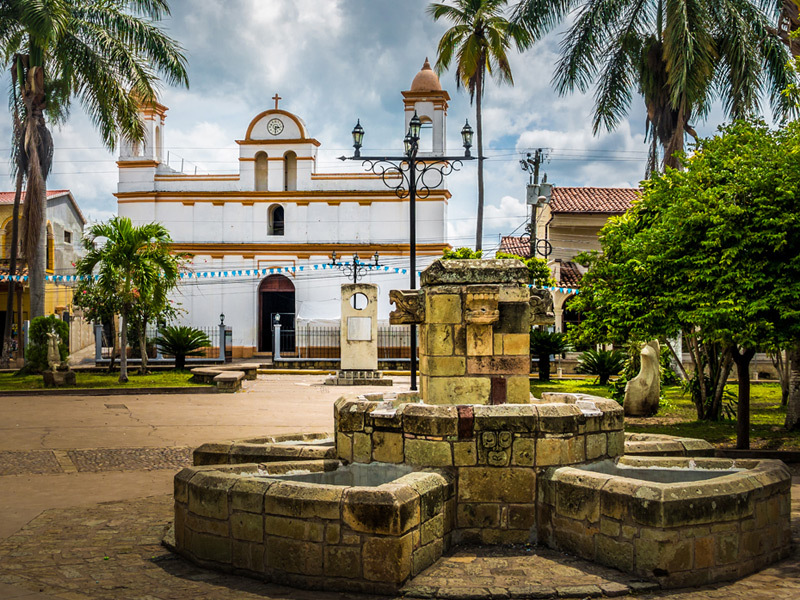 If you enjoy a fine cigar, head to the pretty, colonial mountain town of Santa Rosa de Copán (about two-and-a-half hours away). Here, you can tour the Flor de Copán tobacco factory and learn about the traditional method of rolling cigars by hand. For an authentic taste of Honduran farm life, visit Finca El Cisne, about 45 minutes away. Here, you’ll set out by horse to explore the Copán valley countryside and learn about cattle ranching, coffee, and cardamom. You’ll also enjoy a hearty farmhouse lunch and have a chance to take a dip in the local hot springs.